Right now, I am anticipating the opening of E3 video games show, but “official” announcements just keep leaking out. One of them is these Batman-themed controllers. 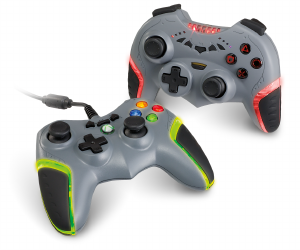 As you might have guessed, these Batman controllers are designed to accessorize the imminent release of Batman: Arkham City. For those who aren’t aware, Batman: Arkham City is a sequel to Batman: Arkham Asylum, a very popular video game. I’m sure that you have noticed by now that they bear resemblance to the Batarang, the main weapon of the caped crusader. These particular controllers come with reverse analog sticks, dual rumble motors, as well as black rubber grips. They even have some LED highlights, like the AFTERGLOW controllers from PDP that we have reported on in the past. They are made for the PS3 and the Xbox 360. You may notice that the Xbox 360 version is wearing a wire, but it is a 10 foot long cord. The Xbox 360 version also has a chat headset port built into it. As for the PS3 version, it has a USB receiver that plugs into the PS3 USB port, as well as a six foot charging cable. These controllers should be available on October 18 this year, the same day that Batman: Arkham City will be released. The price will be about $49.99. Since I am at E3, I want to see if I can get a sight of them at the show.